At work next week we are having a staff retreat day at a park. My fellow colleague and I were tasked with coming up with games for everyone to play while we are at the park. And lets face it my office team is competitive! 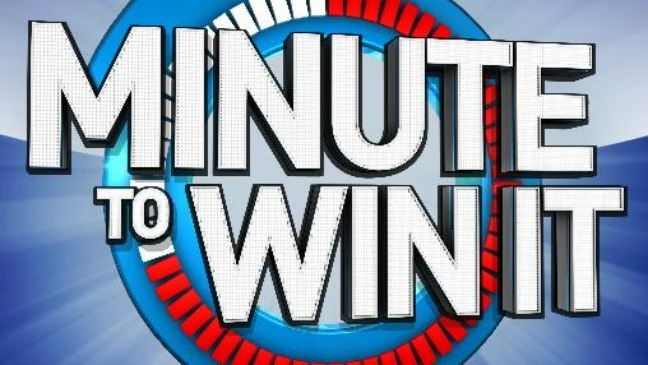 So we’ve come up with a series of minute to win it games that all use supplies we have around the office (and a few from home i.e. shot glasses). We might not limit them to a minute… We tested some of these games and they are way to hard to complete in a minute! And we needed to plan them to be played by teams of two or more. As seen on previous Minute to Win It episodes, contestants have been challenged to compete in a game called This Blows in which the player has to blow up a balloon and use the air in the balloon to blow 15 cups off of a table. The balloon can be blown up as many times as necessary to accomplish this task in 60 seconds. The Mega Bubble Challenge is another game that is easy to duplicate at home. The player is given children’s bubbles and has to blow bubbles and move one across the room by blowing on it. The game is won when the player gets one bubble from point A to point B and through a large ring, like a hula hoop. This is not as easy as it sounds as you have keep blowing bubbles until you have one that is dense enough to move across the room. If the bubble is blown to high in the air, it cannot be controlled and more bubbles must be blown. Player must bounce ping-pong balls into a grid of glasses to get a 3 in a row. Player must alternate color of the ping-pong ball thrown after a ball lands in a glass. 1) Prior to game start, place the open bucket 15 feet away from a designated foul line. Place a second foul line from the cooler perpendicular to the other line. 2) When the clock starts, using the rackets, the players must volley the ping-pong ball back and forth and land it in the bucket. 3) The players may not cross the foul line before the ping-pong ball is hit at least once. 4) The players may not cross the second foul line that lies between them at any time. 5) The players may not carry the ping-pong ball with racket at any time. Player will swing a ball of yarn, attempting to knock off a ping pong boll off the bottle standing on the perimeter of a circle. Player must toss a water bottle onto a table and get it to land upright. 1) Set up foul line 5′ away from table. 2) When the clock starts, player may use 1 hand to flip a bottle end over end to land upright on the table. 3) To complete the game, player must toss and land 1 bottle upright on the table within the 60-second time limit. Tap 3 balloons to keep them off the ground for a minute. Drop 3 quarters into 3 shot glasses that are at the bottoms of 3 fishbowls filled with water. 1) Fill the fishbowls Â¾ full of water and place the shot glass at the bottom in the center of each. 2) When the clock starts, player may grab the first quarter and drop it into the first fishbowl. 3) Player may only hold and grab 1 quarter at a time, and must drop them from a height of 36″ from the floor. 4) To complete the game, player must drop a quarter into each of the 3 shot glasses within the 60-second time limit. Prior to game start, place bottle 14 inches away from “flipping” edge. When clock starts, player places cup upside down on table, and attempts to flip it onto bottle so it lands upside down. To complete game, cup must remain upside down on bottle for 3 seconds within 60-second time limit.